Here is Scott and Alison’s Wedding day in their own words…. Scott proposed to Alison at the top of the Grand Canyon…”It was an eventful day which featured a limousine ride, helicopter rides, a boat ride, the skywalk and Guano the point.” All before Scott finally got down on one knee to ask for Alison’s hand in marriage in August 2014. “It was truly a day to remember and signified the start of our future lives together.” Their wedding plans soon began, in the search for the perfect wedding venue… Once they visited Knowsley Hall, they immediately knew it was the ‘one’. 13 months later and their day had finally arrived. All the planning and thought was about to be thrown into action. With an early start to the day, Alison was excited for the day ahead. With her Bridesmaids and parents around her, she then realised she left part of her wedding dress at home. No fear.. her Make Up Artist Jessica Mae came to the rescue and drove home to pick it up… Let’s just say it resulted in Alison being fashionably late! Conducted in the Stucco ballroom we had champagne gold chivari chairs with their elegance and simplicity, blending in well with the architectural brilliance of the room. The aisle was lined with a thick ivory carpet and masses of candles meandering down the aisle and interwoven with rose petals and cherry blossom. The front of the ceremony house two large blossom trees with hanging tea lights in glass baubles, accentuating the grand display and finishing the room off perfectly. Hosted in the State dining room, with its numerous oil portraits, wooden panelling from floor to ceiling, impressive dome skylight which allows natural light to flood the room and finished off with a large golden chandelier. The Top table took pride of place and was positioned in the impressive bay window overlooking the grounds and lake in the backdrop. Glass cylinders were filled with water and floating candles to create amazing candlelit effects, further enhanced by ivory rose bouquets, fresh rose petals and cherry blossom meandering through the design to reflect the cherry blossom trees and floral element of the wedding theme. The 3 most central tables held large, architectural cherry blossom trees with masses of glass baubles falling from the branches. Each bauble held individual tea lights to create the vital illumination, which was further enhanced by masses of floating candles and tea lights around the base. The 4 outermost guest tables held a rose gold candelabra with five long burning ivory candles, the base was surrounded by masses of rose gold and glass tea lights to create impact and bring interest to the table level. All tables finished off with floor length, rose gold sequin table clothes to bring a touch of glamour and shimmer to the wedding breakfast. 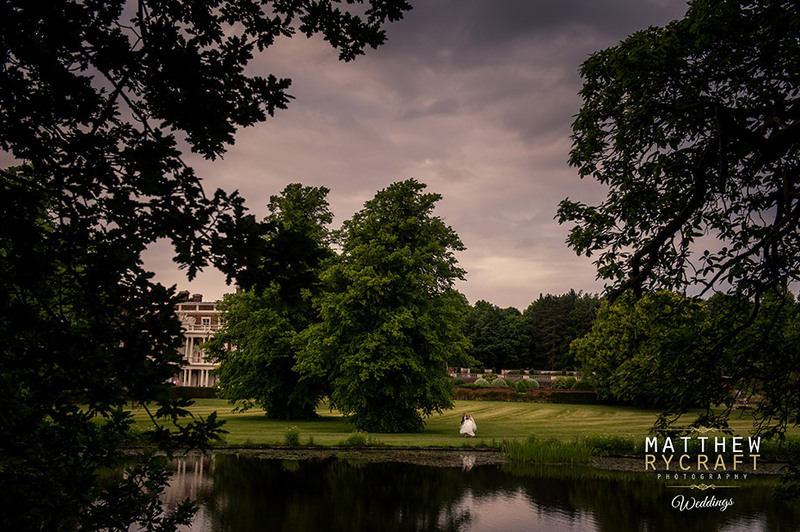 “Matthew was fantastic and is absolutely dedicated to his work, focusing on how best to capture those magical moments throughout the day. With his unobtrusive style, he is able to capture moments that others would have missed. These are the ones that tell the true story and really show off the emotions and feelings on the day. Who helped Scott and Alison’s make their wedding day special.